An upscale real estate developer decided he needed to advertise his property in a big way. He commissioned a sign be built – 13 letters, each one 50 feet tall, and set on the hillside overlooking his development. The letters were so big that telephone poles were used to secure them in place. And then they were lit. The dazzling white display said: HOLLYWOODLAND. The developer thought he would keep the sign up about a year, but then something unexpected happened – it became a tourist attraction. The sign lasted many years, but slowly showed signs of succumbing to the elements. 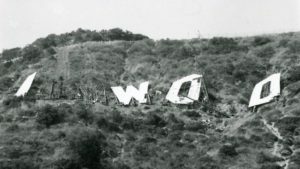 In 1949, the LA Parks and Recreation Department and the Hollywood Chamber of Commerce got together to save the sign. They removed the last four letters – LAND – fixed the other 9 letters and removed the light bulbs. By 1978, the sign, now a cultural and historical landmark, was again redone. This time, the old letters were completely removed. 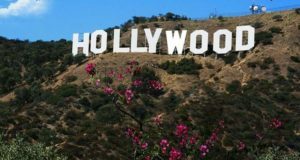 For three months, there was no Hollywood sign on the mountain. The new sign was 450 feet long and weighted almost half a million pounds. The sign and the acres around it are now protected both legally and electronically. The letters are close to their original size. All are 45 feet tall and vary in width from the 31-foot L to the almost 40-foot W.
The sign, unfortunately, has a beautiful ghost. 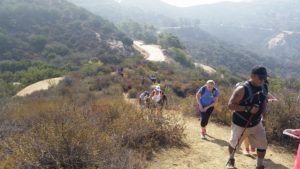 Quite a few people have met her on the trails. 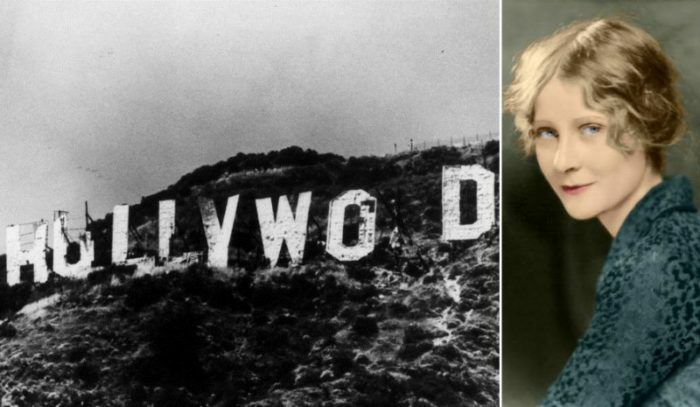 In 1932, dealing with a number of issues, an actress named Peg Entwistle, 24, told her uncle she was going to the store to buy a book, and then maybe go visit some friends. Instead, she took a walk up into the Hollywood hills. When she got to the huge letters, she saw that there was a workman’s ladder there. She climbed to the top of the H and jumped. Her story has been featured in movies and songs. And when people encounter her, they smell a strong aroma of gardenias – her favorite flower. But for a workman’s ladder!